An Italian town is pursuing legal action against the French satirical magazine Charlie Hebdo for publishing a cartoon mocking the victims of Wednesday's deadly hotel avalanche. The caricature depicts Death riding the avalanche down the mountain on skis holding two scythes instead of ski poles. "Italy. It's snowing," the sign reads. Outraged by the depiction of the tragedy at the Rigopiano di Farindola hotel, the Mayor of Farindola, Ilario Lacchetta, decided to sue the French weekly magazine, a number of Italian news outlets reported. Issuing a mandate to pursue legal action, Lacchetta said the caricature goes beyond bad taste, and is as unwelcome as the Amatrice cartoon published by Charlie Hebdo, in which it teased the quake-devastated town of Amatrice which was destroyed in August. The Amatrice cartoon - published in September and titled “Earthquake Italian Style” - portrayed quake victims with typical Italian dishes. The caricature showed a man covered in blood standing with a sign over his head reading “penne in tomato sauce.” A man is depicted next to a badly injured woman survivor who is labeled “penne au gratin.” The icing on the satirical image shows people squashed in the rubble with feet sticking out between the floors of a collapsed building with the sign reading “Lasagna”. "We found closeness and solidarity between us and Amatrice- two communities affected by an outrage that has nothing to do with satire", the Mayor of Farindola said. In September, the mayor of Amatrice, Sergio Pirozzi, sued the French weekly for aggravated defamation in a lawsuit filed by the Court of Rieti. As social media exploded with disgust over Charlie Hebdo’s latest work, Italian cartoonist, Ghisberto, published a counter-satirical cartoon. Incorporating the original Death riding the avalanche theme, the Italian artist added a picture of the Italian Mountain Rescuer passing Death, pointing a middle finger at it. Despite the severe weather conditions and in a race against time, rescuers have managed to save 11 people from the mountain of snow that covered the hotel. Five people were found dead and another 23 remain missing. 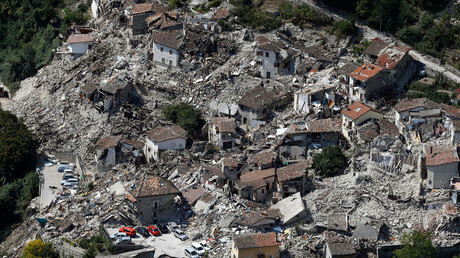 Rescuers continue to comb the hotel Rigopiano in adverse conditions to search for survivors. Charlie Hebdo made headlines in 2015 following the publication of a series of controversial Prophet Mohammed cartoons. The same year, the outlet was hit by terrorist attack when two Al-Qaeda linked assailants killed 12 people. Honte éternelle sur Charlie Hebdo!Vous insultez les morts italiens pour l'avalanche.Crachez sur ceux qui étaient avec vous.Horreur!! Undeterred, the magazine continued to publish provocative cartoons, including one on the massacre in Paris in November 2015. Charlie Hebdo has also produced a series of caricatures poking fun at the plane crash which killed Russia’s Red Army choir in the Black Sea in late December. Last month's publication sparked wide outrage and condemnation in Russia.